There are many variables of success in an in-vitro fertilization/embryo transfer (IVF/ET) cycle, few are beyond our control but are thought to be directly related to the implantation and successful outcome. The implantation potential of good quality embryos remains low during IVF/ET treatment, despite advances in ovarian stimulation regimens, the method of assisted fertilization and improved culture conditions. Successful implantation depends on a close dialog between the blastocyst and the receptive endometrium. Different strategies have been developed to evaluate endometrial receptivity, such as the histologic dating of an endometrial biopsy,  endometrial cytokines in uterine flushing,  the genomic study of a timed endometrial biopsy  or more commonly a non-invasive ultrasound examination of the endometrium. Ultrasound examination of the endometrium is a commonly used non-invasive method to assess endometrial receptivity during IVF treatment. A good blood supply towards the endometrium is usually considered to be an essential requirement for implantation and therefore assessment of endometrial blood flow in IVF treatment has attracted a lot of attention in recent years. Doppler study of uterine arteries does not reflect the actual blood flow to the endometrium. 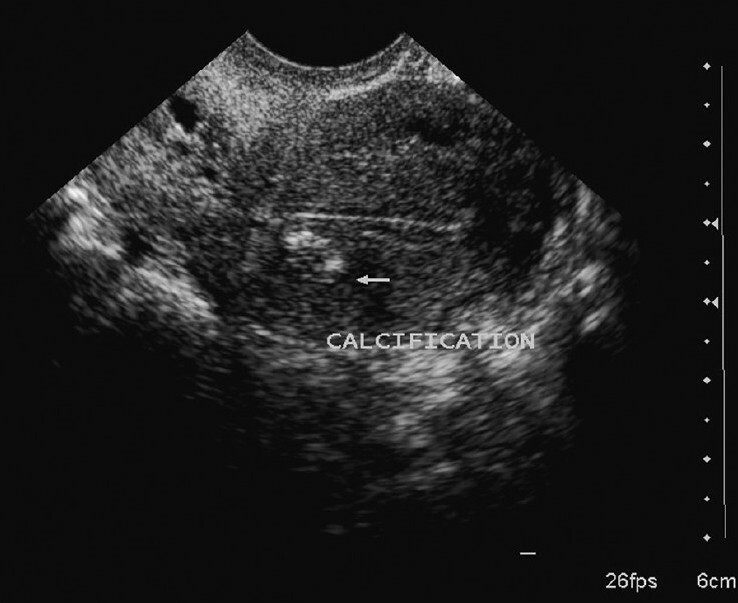 Endometrial and sub-endometrial blood flows can be more objectively and reliably measured with three-dimensional power Doppler ultrasound. However, conflicting results are reported with regard to their role in the prediction of pregnancy in IVF treatment. The aim of our study was to evaluate the role of endometrial thickness, pattern and sub-endometrial blood flows measured by 2D power Doppler ultrasound on the day of hCG to predict pregnancy during IVF treatment. Ultrasound parameters including endometrial thickness, endometrial pattern, endometrial volume, Doppler study of uterine arteries and endometrial blood flow have been used to assess endometrial receptivity during IVF treatment. Assessment of endometrial blood flow adds a physiological dimension to the anatomical ultrasound parameters and has drawn a lot of attention in recent years. This prospective clinical study was undertaken at the IVF unit of Department of Obstetrics and Gynecology and was approved by the institute's Ethics Committee. The women participating in the study gave their written consent. One hundred and one subjects were recruited in the study of age group (20-42 years) undergoing IVF-ET/ICSI for primary or secondary infertility for various etiologies like tubal, male, endometriosis, PCOS, unexplained factors. The patients were stimulated using standard long protocol using GnRH analog for pituitary suppression followed by stimulation using recombinant FSH and HMG. The blood flows was recorded on the day of hCG administration in the endometrial and sub-endometrial zones using Siemens USG machine. The same dose of hCG, 10,000 IU intramuscularly was administered when there were at least three leading follicles of size 17-18 mm, and 36 h later the ovum pickup was performed under intravenous sedation. After a true longitudinal view of the uterus had been obtained, the endometrial thickness was measured as the maximum thickness between the highly reflective interfaces of the endometrial-myometrial junction. The measurement included both layers of the endometrium. The surrounding low-amplitude echo layer was excluded, because it represents the inner layers of the myometrium. Endometrial morphology was classified as types A (hyperechoic), B (isoechoic) and C (triple-line) endometrium, respectively. 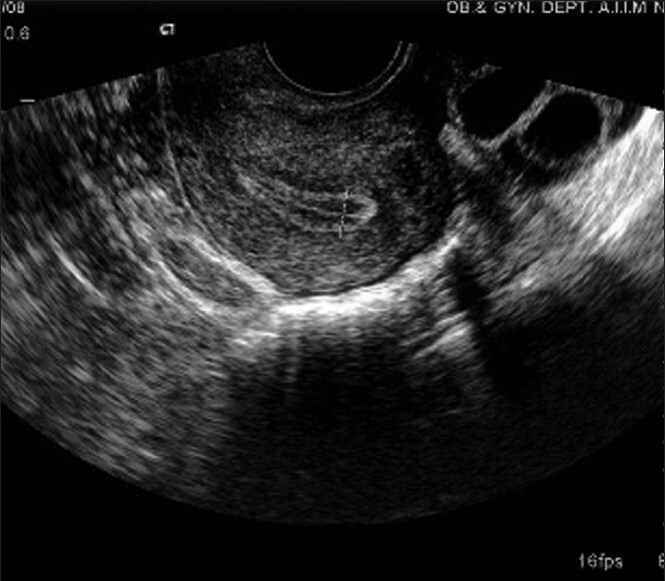 A triple-line pattern was described as hypo-echogenic endometrium surrounded by a hyper-echogenic zone [Figure 1]. The zones of vascular penetration into the sub-endometrial and endometrial regions have been defined as: Zone I i.e. the sub-endometrial zone, Zone II is the outer hyperechogenic zone and Zone III is the inner hypoechogenic zone [Figure 2]. After completion of the B-mode examination a 6-MHz pulsed Doppler system was used for blood-flow analysis. The blood-flow velocity waveforms from the sub-endometrial vessels were obtained by placing the Doppler gate over the color area and activating the pulsed Doppler function. A recording was considered satisfactory when at least five consecutive waveforms were obtained, each demonstrating the maximum Doppler shift. The resistance index (RI=peak systolic velocities - peak diastolic velocities/peak systolic velocities) and S/D ratio was calculated on three consecutive uniform waveforms. All examinations were performed by one investigator with Siemens Acuson Antares (Siemens Medical Solution, USA, Inc). 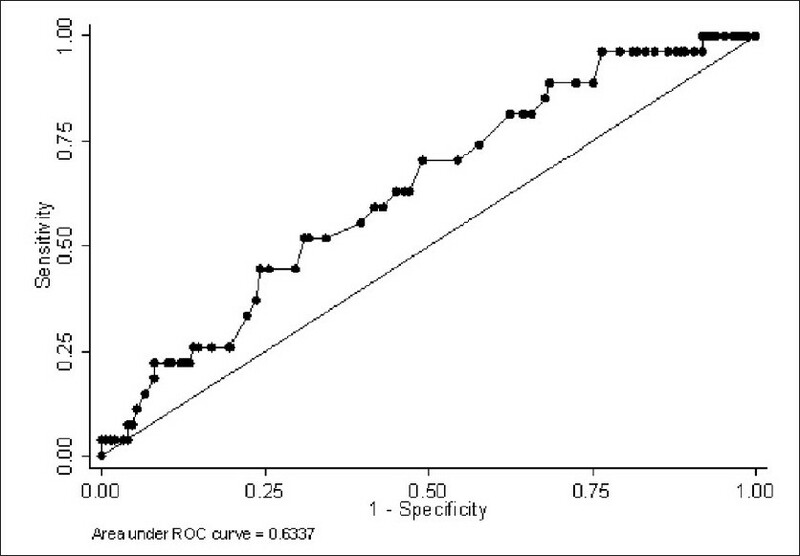 The reproducibility of Doppler measurements was tested in 10 patients, in whom RI was measured by the same operator three times at 10 mins intervals and analyzed by analysis of variance. Patients had two or three embryos replaced into the uterine cavity 48 h after the retrieval. Surplus good quality embryos were frozen. Luteal phase support was given by 100 mg intramuscular progesterone daily. A urine pregnancy test was done 16 days after embryo transfer and if positive, ultrasound examination was performed three weeks after embryo transfer to confirm intrauterine pregnancy and to determine the number of gestational sacs present. Only clinical pregnancies defined by the presence of one or more gestational sacs or the histological confirmation of gestational product in miscarriages was considered. Ongoing pregnancies were those pregnancies beyond 10-12 weeks of gestation, and patients were then referred for antenatal care. The primary outcome measure in this study was pregnancy and secondary outcomes were endometrial thickness and blood flow. Multiple logistic regression analysis and the receiver operator characteristic (ROC) curve analysis were applied to determine the best predictive variables [Figure 3]. Statistical analysis has been performed using the Statistical Program for Social Sciences (SPSS Inc., Version 12.0, Chicago, USA). The two-tailed value of P < 0.05 was considered statistically significant. 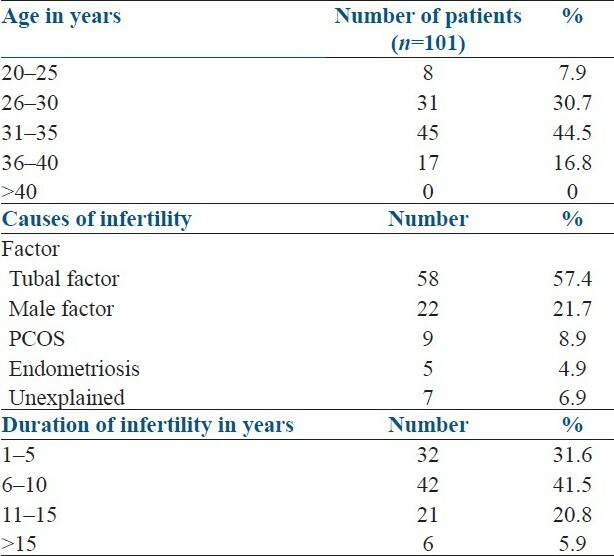 Total number of patients recruited was 101, their mean age was 35 years, mean duration of infertility was 8 years [Table 1]. Seventy five (74.25%) patients had primary infertility and 26 (25.74%) had secondary infertility. The mean endometrial thickness was 8.1 mm. The endometrial blood flow was in Zone I in 18 patients, 28 patients had blood flow in Zone II and 54 had in Zone III. Mean S/D ratio on Doppler was 3.7. Overall twenty seven (26.73%) patients conceived and in these women the endometrial thickness was between 6 and 12 mm [Table 2]. Only one achieved pregnancy with an endometrial thickness of less than 6 mm and one when the thickness was between 12 and 14 mm. The endometrial blood flow directly correlated with the outcome of IVF cycle. Fourteen (51.8%) patients who became pregnant had blood flow in Zone III [Table 3]. The endometrial echo pattern did not correlate with pregnancy outcome. We found three patients with calcifications in the uterus and two with fluid in the endometrial cavity on the day of hCG. Endometrial receptivity is crucial to implantation of an embryo. It is agreed that both endometrial thickness and endometrial pattern are useful as prognostic parameters for successful pregnancy in in-vitro fertilization/intracytoplasmic sperm injection and embryo transfer (IVF/ICSI-ET). Adequate perfusion to the endometrium is vital to implantation. No consensus has been reached with regard to the minimum endometrial thickness required for successful pregnancy. Pregnancies did not occur when the endometrial thickness was less than 7 mm;  however, other studies found that a minimum endometrial thickness of 6 mm is acceptable for implantation. ,,, Interestingly, Sundström reported a successful pregnancy with an endometrial thickness as little as 4 mm. In our study, the thinnest endometrial lining for successful ongoing pregnancy was 5.8 mm and maximum number of conceptions occurred when the thickness was 8-10 mm. With increasing endometrial thickness (>14 mm), a high miscarriage rate was reported by Weissman,  which was not observed in the present study. In a prospective study, Wang et al,  studied the endometrial thickness, echo pattern and blood flow on transvaginal sonography in 182 women, eight hours prior to hCG injection. They observed a higher clinical pregnancy rate and implantation rate in women with detectable blood flow. Ng et al,  observed a lower vascularity in the endometrial and sub-endometrial region by a 3D power Doppler in patients who had low-volume endometrium as compared to those with thin endometrium. Several studies have suggested that a premature secretory endometrial pattern is introduced by the advanced progesterone rise, and this premature conversion has an adverse effect on pregnancy rates. The reason that no-triple-line endometrial pattern was observed prior to ovulation is not known and cannot be explained by higher progesterone levels. 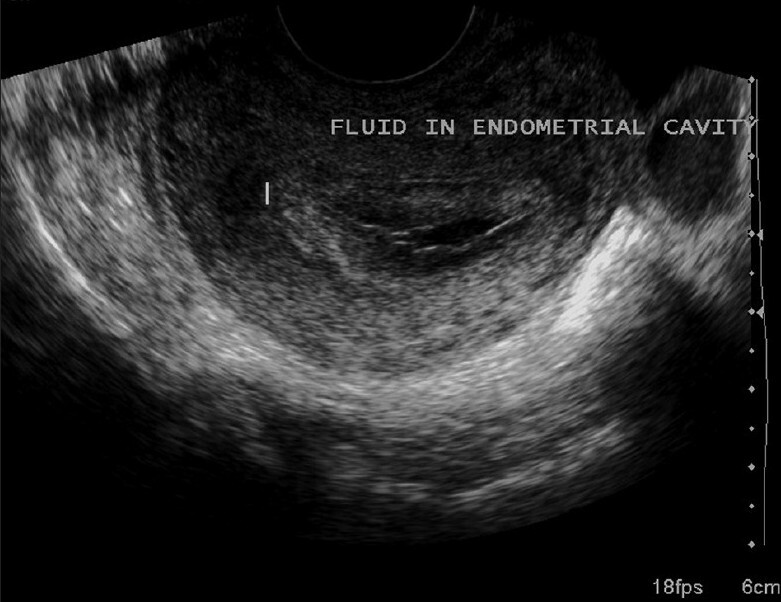 The three patients with calcifications [Figure 4] in the uterus and two with fluid in the endometrial cavity [Figure 5] on the day of hCG did not conceive. These perhaps are poor prognosticating factors in the success of IVF. The coexistence of a thinner endometrium in association with no-triple-line pattern reflects a diminished endometrial responsiveness to ovarian hormones and poor receptivity of the endometrium, leading to a low clinical pregnancy rate and poor clinical outcome. One limitation of our study is that the number of subjects in the study population was too small to make a definitive statement. In conclusion, when a thinner endometrium (≤7 mm) and no-triple-line endometrial pattern coexist in an IVF/ICSI candidate, cryopreservation should be recommended. However, further study is needed to make a definitive conclusion. With a thin endometrium and a good texture (triple-line), other prognostic factors, such as embryo quality, should be taken into consideration. The endometrial vascularity has a useful predictive value on the implantation rate in IVF cycles irrespective of the morphological appearance of the endometrium. 1. Noyes RW, Hertig AT, Rock J. Dating the endometrial biopsy. Fertil Steril 1950;1:3-25. 2. Lédéé-Bataille N, Laprée-Delage G, Taupin JL, Dubanchet S, Frydman R, Chaouat G. Concentration of leukaemia inhibitory factor (LIF) in uterine flushing fluid is highly predictive of embryo implantation. Hum Reprod 2002;17:213-8. 3. Horcajadas JA, Pellicer A, Simón C. Wide genomic analysis of human endometrial receptivity: New times, new opportunities. Hum Reprod Update 2007;13:77-86. 4. Oliveira JB, Baruffi RL, Mauri AL, Petersen CG, Borges MC, Franco JG Jr. Endometrial ultrasonography as a predictor of pregnancy in an in-vitro fertilization programme after ovarian stimulation and gonadotropin-releasing hormone and gonadotropins. Hum Reprod 1997;12:2515-8. 5. Gonen Y, Casper RF. Prediction of implantation by the sonographic appearance of the endometrium during controlled ovarian stimulation for in vitro fertilization (IVF). J In vitro Fert Embryo Transfer 1990;7:146-52. 6. 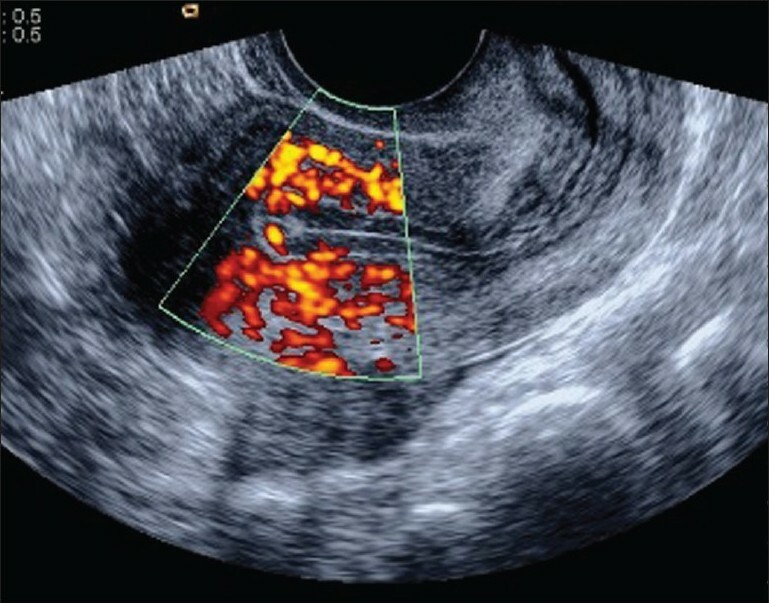 Gonen Y, Casper RF, Jacobson W, Blankier J. Endometrial thickness and growth during ovarian stimulation: A possible predictor of implantation in in vitro fertilization. Fertil Steril. 1989;52:446-50. 7. Shapiro H, Cowell C, Casper RF. The use of vaginal ultrasound for monitoring endometrial preparation in a donor oocyte program. Fertil Steril 1993;59:1055-8. 8. Coulam CB, Bustillo M, Soenksen DM, Britten S. Ultrasonographic predictors of implantation after assisted reproduction. Fertil Steril 1994;62:1004-10. 9. Sundström P. Establishment of a successful pregnancy following in-vitro fertilization with an endometrial thickness of on more than 4 mm. Hum Reprod 1998;13:1550-2. 10. Weissman A, Gotlieb L, Casper RF. The detrimental effect of increased endometrial thickness on implantation and pregnancy rates and outcome in an in vitro fertilization program. Fertil Steril 1999;71:147-9. 11. Rashidi BH, Sadeghi M, Jafarabadi M, Nejad EST. Relationships between pregnancy rates following in vitro fertilization or intracytoplasmic sperm injection and endometrial thickness and pattern. Eur J Obstet Gynecol Reprod Biol 2004;120:179-84. 12. Noyes N, Hampton BS, Berkeley A, Licciardi F, Grifo J, Krey L. Factors useful in predicting the success of oocyte donation: A 3-year retrospective analysis. Fertil Steril 2001;76:92-7. 13. Mercé LT, Barco MJ, Bau S, Troyano J. Are endometrial parameters by three-dimensional ultrasound and power Doppler angiography related to in vitro fertilization/embryo transfer outcome? Fertil Steril 2008;89:111-7. 14. Wang L, Qiao J, Li R, Zhen X, Liu Z. Role of endometrial blood flow assessment with color Doppler energy in predicting pregnancy outcome of IVF-ET cycles. Reprod Biol Endocrinol 2010;8:122. 15. Ng EH, Yeung WS, Ho PC. Endometrial and sub endometrial vascularity are significantly lower in patients with endometrial volume 2.5 ml or less. Reprod Biomed Online 2009;18:262-8. Lucena, E. and Moreno-Ortiz, H.
Jimenez, P.T. and Schon, S.B. and Odem, R.R. and Ratts, V.S. and Jungheim, E.S. Gleicher, N. and Kim, A. and Michaeli, T. and Lee, H.-J. and Shohat-Tal, A. and Lazzaroni, E. and Barad, D.H.
Zhu, W. and Chen, M. and Liu, J. and Fu, Z. and Li, X. and Qin, C. and Liu, D. and Tang, X.
Selim, M.F. and Borg, T.F. Heger, A. and Sator, M. and Pietrowski, D.
Basirat, Z. and Esmailzadeh, S. and Jorsaraei, S.G.A. and Firoozpour, M. and Abdolhashempour, S.